Happiness Project:#55: Happy Heart Cookies! Love. Friendship. Happiness. Joy. Pain. Sadness. Life. For those of you who have been following my blog, from the very first recipe post, a little over 2 years ago, you’ve seen my Heart here. My Joys. My Life. My Struggle. For everything worth meaning. And you know of the importance I place upon being able to express all of these feelings & experiences. Because I believe in the power of sharing one’s Life and one’s Heart to those who will listen. No matter how shadowed or darkened that I may be. And it’s because of you, you who support and love me through it all, that I’ve journeyed to where I am today. It’s because of YOU that I am still here. In more ways than one. And it’s because of you that I know, truly know, of the immeasurable blessings within this beautiful little life of mine. Preheat your oven to 350F. Spray a 9×10 inch glass baking dish. Then layer with parchment paper. Lightly coat (again) with (a butter & flour) spray. Set aside. In a large mixing bowl, combine the flour, baking soda, salt and cinnamon, and stir for a few minutes until nicely combined. In another large bowl, on a stand mixer (or by hand held), beat the butter, brown sugar and granulated sugar on high until fully blended and creamy. Beat in the eggs, one at a time, until fully incorporated. Blend in the vanilla extract and continue mixing for 3 to 4 minutes. Stir in the flour mixture, in two batches, until just combined.Then throw in those chocolate chips and stir em up! Spoon out the cookie dough into the prepared dish and evenly spread out the entire dough with either a rubber spatula or the flat of your hands. *I prefer to use my hands with most of my cookie recipes so that I can feel the dough between my fingers. There’s something uniquely therapeutic (and magical even) about working with cookie dough within ones hands, instead of with a spatula or rolling pin. And wonderfully, beautifully messy. Once you’ve spread out and flatted the cookie dough in the baking dish, pop it into the oven and let bake for 20-25 minutes, depending upon how firm or slightly gooey you like a chocolate chip cookie’s center. Though when it comes to cookies, any cookies, there’s never really any right or wrong way to create the perfect cookie. Right? Right! 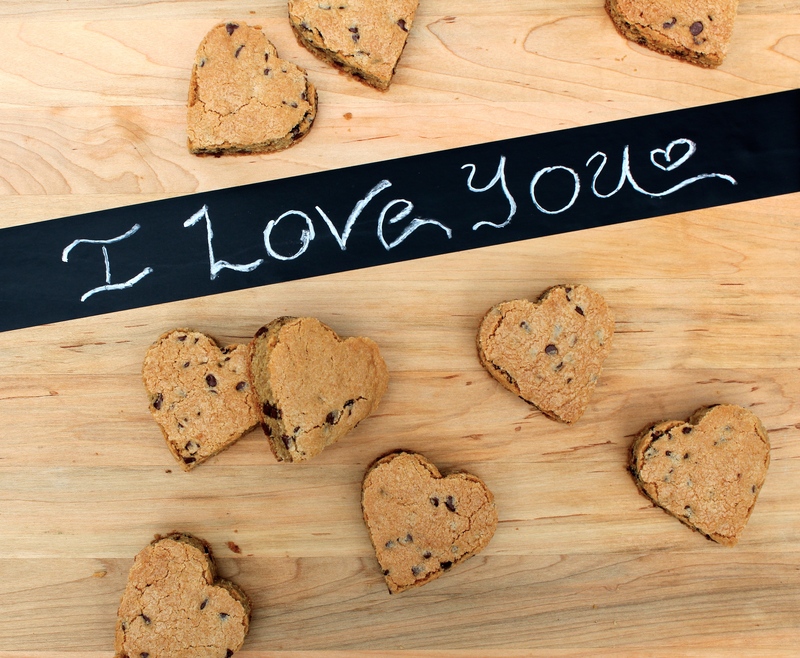 Let cool on a wire rack for about 10-15 minutes before getting creative with your heart (or any other) shaped cookie cutters. When using your cookie cutters with this baked cookie, gently press the cutter into the giant cookie so that it doesn’t crumble or break. Gently extract each cut heart piece and serve! Or store in a favorite family cookie jar or fun container for up to 4 days. « Happiness Project: #54: Birthday Candy Popcorn!